The video reel opens with a fat cat squeezing itself into a narrow-mouthed opening, a little comedy that ends with the cat’s tail poking sinuously out the top. Later, there is a poignant encounter between a hair dryer and a blind kitten, which flails its paws at the heat, the wind, and noise. Elsewhere, a black cat plays the villain, rudely swatting a pill bottle off a dresser, then turning to the camera to deliver a contemptuous yawn. Such videos are clearly a staple of popular culture, but are they also art? “Cat videos seem to transcend language and culture,” said Scott Stulen, the Walker curator in charge of the festival, whose life as a mild-mannered museum employee was upended last year when people turned out in droves to see his video reel, and far-flung cultural institutions started clamoring to screen it. “People are really passionate about this,” said Mr. Stulen, who will be on hand in Brooklyn as M.C. The sold-out show (the $20 tickets were going for $40 on StubHub.com) at Warsaw will be tailored to the local residents: a New York band called Supercute! Will play, and five feline-focused cinematographers from the tristate area will answer questions. Lil Bub, a kitten with dwarfism and a lolling tongue who has achieved viral fame, will be there — presumably for as long as she can stand it — as will Will Braden, the creator of Henri, Le Chat Noir; he’ll show a new Halloween-themed video about his world-weary French cat. 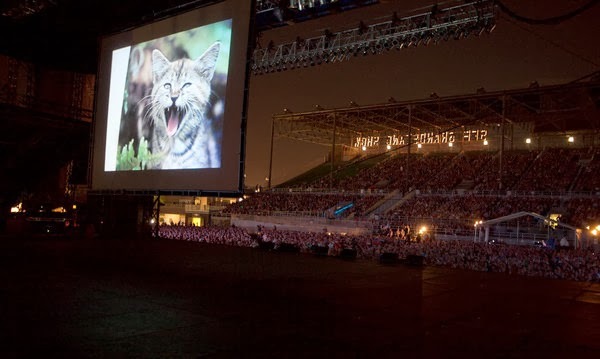 The festival began in 2012 when the Walker screened its first reel of cat videos in an open field as an end-of-summer lark. It was supposed to be a small, low-key event, but — surprise — 10,000 people showed up, and suddenly other museums and nonprofits wanted a piece of the cat video action. The festival has become a signature program for the Walker, a piece of performance art that may be a “Rocky Horror Picture Show” for the digital age. The curious thing, of course, is that all the videos in the film are freely available online, although in longer forms and with lots of ads. Still, people come out and pay to see them. “We’ve basically sold out everything that we’ve done,” said Mr. Stulen, who is not a cat owner (and is quick to explain that his son is allergic). The highbrow-lowbrow dichotomy is definitely part of the attraction, said Mr. Stulen, who has a master’s degree in painting, drawing and art history and estimates that he has seen more than 30,000 cat videos. In one 10-second clip on his reel, a cat in a cardboard box on a skateboard whizzes by, glancing at the camera. 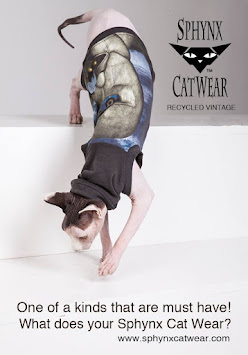 In another, three hairless sphynx cats bob their heads in eerie unison to Mozart’s “Eine Kleine Nachtmusik.” A video called “Cat in a Shark Costume Chases a Duck While Riding a Roomba” is both deadpan and bizarre, especially when a pit bull wanders in also dressed as a shark. If you are at all a fan of cat videos — and come on, you are — some of these will be familiar and others will not. “People keep asking the questions, ‘Is this art, and if this is not art, what is art?’ ” said Rachel Lee Joyce, a publicist for the Walker. From the museum’s perspective, she said, acting as the catalyst for such discussions is the goal. The new reel had its first showing at the Minnesota State Fair on Aug. 28 and drew 11,000 people, many of whom apparently knew the drill. “At one point, the audience just started chanting: ‘Cats! Cats! Cats! Cats! Cats!’ ” Ms. Joyce said. Her job has also taken a curious turn, thanks to the festival. Instead of trying to drum up interest among big-city journalists for contemporary-art exhibitions in Minneapolis, she now tries to keep up with a deluge of queries from reporters around the world. “I joked with my friends that the BBC was calling me like I owed them money,” Ms. Joyce said. “I feel like I was making certain styles of videos years before other people were,” said Mr. Schleichkorn, 31, adding that he feels a bit robbed by some of the individuals who have jumped into the game. “There’s a running joke that Grumpy Cat stole the whole shtick from me,” he said. The sold-out Internet Cat Video Festival is on Friday at 7 p.m. at Warsaw, 261 Driggs Avenue, at Eckford Street, Greenpoint, Brooklyn; warsawconcerts.com.